IPv6 - what is it and why is it important? This means that either your operating system, broadband router or your service provider isn't IPv6 enabled. Don't worry--This is the case for most broadband users today. We would advise you to talk to your service provider about their plans to support IPv6, to encourage them to start work on enabling IPv6 on their network. IPv6 is supported by most of the latest operating systems including Microsoft Windows Vista, Windows 7 & 8 as well as Mac OS X. Whether you connect to IPv6 natively through a Teredo tunnel, 6to4 or natively, having IPv6 connectivity will become a necessity in the near future. IPv6 is the successor to IPv4, the Internet addressing protocol which has been used for many years since the early days of the Internet. When the Internet was first founded, it was established as a research network (ARPANET), and the addressing was limited. It was never thought that it would be used to connect everything from a mobile phone to a hi-fi and fridge to the 'net. As such, it is estimated that we will run out of available existing IPv4 based addresses in 2011 or 2012, so a new protocol has been developed that will work around this problem. 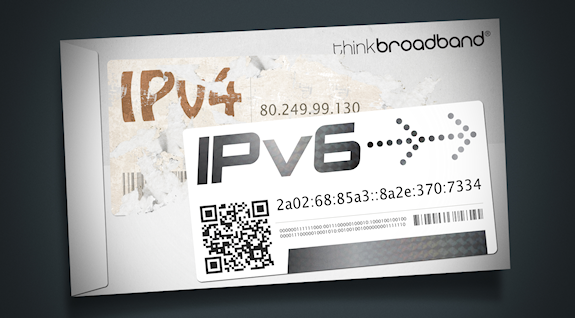 This is IPv6 and it also introduces some new features to improve how the Internet works. An IP (Internet Protocol) address is used on the Internet to contact a computer in a similar way that a telephone number is used to connect to a telephone line. Each IP address is unique and any data that is sent to that address will be routed through the Internet to arrive at the destination of that computer. Most people will be more familiar with easy to remember hostnames such as www.google.com which are looked up in a directory called DNS (similar to a yellow pages) and translated in to the IP address. You can often use the IP address instead of the hostname (for example typing http://80.249.99.130/ (or http://[2a02:68:1::4]/ for IPv6 users) in the address bar in a web browser will bring you to this website. The current IPv4 address space contains 4.3 billion addresses. The number of addresses offered by IPv6 is 340,282,366,920,938,000,000,000,000,000 billion (2 to the power of 128) which means that the size of the Internet could double every year and we would still have enough addresses for the next 96 years. How can I use IPv6? There are several ways to use IPv6. Natively means you connect directly over an IPv6 network and would require your service provider to support it (few currently do). To connect natively you will also need a broadband router to support IPv6, and there are currently few of these available. Tunnelled IPv6 is a way of tunnelling IPv6 over an IPv4 network so you can connect to IPv6 services. Most operating systems currently support both native and tunneled and Windows Vista and Windows 7 both allow you to connect over a Teredo tunnel. Even an iPhone will allow you to connect with IPv6. At the moment, you should not have to do anything. In an ideal world, network operators should ensure that a smooth switch over occurs so that users do not need to do anything. If you run or host a website, you may want to check with your hosting provider if they provide IPv6 and how they can help with implementing this. You can check if you are IPv6 compatible with our IPv6 readiness tool. Why do I want IPv6 if no one supports it? IPv4 exhaustion is happening. The last available IP blocks have been assigned to the regional registries and they will now be rationing this stock until it is fully depleted. Once there are no more IP's left, providers will either need to start providing IPv6 addresses to users or will resort to using Carrier Grade NAT (CGN). NAT doesn't give users a real IP address and can break certain applications like online gaming or VoIP, although these are becoming more compatible. Adopting IPv6 will make sure you are ready for it. There is no doubt that IPv4 will be around for a long time, but once IPv6 grows, those not able to use IPv6 may find that parts of the Internet are inaccessible. Can I just move to using IPv6 instead of IPv4 now? Whilst moving completely to IPv6 is an option if all your devices support it, you will need to use NAT64 to be able to access the rest of the Internet generally. Whilst some sites such as Google (and us here at thinkbroadband) support IPv6, you will need to know the specific hostname of the IPv6 version of their website to be able to access it. Google does not currently return search results tailored to IPv6 users. Some websites which claim to support IPv6 still rely on various pieces of the IPv4 world to function, so in reality, using only IPv6 is not an option at the moment. Why are more sites not already IPv6 enabled? There is a problem which exists with some clients which can mean if IPv6 is enabled on a website, it will not work or will be very slow. This is known as the "dual stack" problem and is caused by the computer favouring an IPv6 connection which isn't working over an IPv4 connection. This has worried web site operators and has stopped them from enabling their website as a full IPv4/IPv6 site in fear of not reaching some users. World IPv6 Day was scheduled for the 8th of June 2011 and saw many websites do a 24-hour test where they 'dual stack' their website. This provided valuable feedback and show the state of readyness that the world is currently in for IPv6. Google, Facebook, Yahoo, Akamai and others took part which meant that many of their users possibly used IPv6 for the first time.